Planning business trips can be a headache, especially if you’re the person in charge of coordinating the trip for everyone on your team. You may have to book flights, transportation, make reservations, all on top of worrying about having a successful meeting or convention. If planning a trip and saving money is on the agenda, then please read on! Creating a budget, and sticking to it, can be an easy way to keep your expenses to a minimum. Make suggestions for how much money should be spent on each meal to give some guidance to limit the overall costs. If your company has a credit card that allows you to collect points, check it out and see if there are any points you can use. Points can cover flights, hotel costs, and transportation, which can make a huge difference in the total cost of the trip. A mini coach rental could save you money and time when it comes to ground travel. 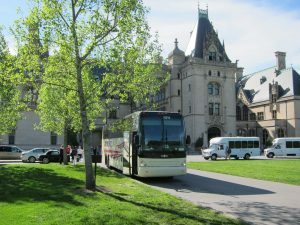 You can travel comfortably on a coach bus, knowing you and your team will arrive to your destination together and on time. There are many benefits of bus travel, like keeping your group together, having a schedule to ensure you arrive on time, comfortable seating, and with WiFi on a bus, you can even do work during your traveling time. It’s also an easy way to reduce your environmental impact. Compared to other modes of transportation, motorcoaches emit the least carbon dioxide per passenger mile. So whether you’re traveling to a local location, or in a different country, a mini coach rental is definitely something worth looking into. Planning ahead can save you money in the long run. Booking hotels and flights early will give you cheaper prices. Look into restaurants around where you’re staying and pick a few decently-priced ones so you don’t wander into an outrageously expensive restaurant. Sharing hotel rooms can be a major cost saver. This can also allow your team members to bond and share the full experience. Try to book transportation together, which will not only reduce cost but will also ensure that everyone arrives at the same time. If you and your team follow these few tips and tricks, you’re sure to have a successful, low-cost business trip.